Why invest in emerging markets? This FREE Special Report has the details. Investment advisors say that about 30% of an individual’s equity portfolio should be in international stocks. Yet, research has shown that one out of five individual investors think they should have 10% or less of their stock portfolios in international equities. Are you one of those investors? Emerging market economies are growing much faster than America’s. China is expecting 6.5% GDP growth in 2017, more than double the expected growth rate in the U.S. and nearly double the global average. India is projected to grow nearly as fast in 2017. You really don’t want to be one of those investors, do you? Investing in world stock markets is, in our view, essential to a balanced portfolio. And that’s why we’re giving away this expert Special Report, Why You Should Invest in Emerging Markets—and Other World Stock Markets. Download it now and start profiting from emerging markets tomorrow. We understand. Your probably know you could make some real money in the emerging markets … but you have questions. Concerns. Even good old-fashioned patriotism! Find out why and how in this FREE Special Report, Why You Should Invest in Emerging Markets—and Other World Stock Markets. This Special Report starts right out delivering exactly the steps you need to take to start trading internationally without worries or regrets. For example, did you know there’s a way to get all of the same assurances on accounting and reporting standards for investments in the world markets that you get when you invest in the U.S.? Learn more when you read the report! You’ll also learn how to minimize your losses, based on our tried and true advice. You’ll even get the details of Cabot’s widely-trusted SNaC approach to investing (Story, Numbers and Chart), which works equally well for U.S. investments and world stock market investments alike. That’s the kind of story you can take to the bank, and because you’ll be investing in the high-growth emerging markets, imagine how much profit you can make! Why should you invest in the world stock markets? Find out now. Refusing to diversify a stock portfolio can lead to outsized losses. The opportunity risk of avoiding international and emerging market equities is substantial. The US is expecting a reasonably healthy GDP growth rate in 2017 of 2.3% … while China is expecting 6.5% and India is projected to grow at 6.4%. It’s true. Emerging market stocks offer the kind of growth potential that you simply can’t get from investing in your average U.S. company. And, as I mentioned earlier, there are ways to avoid the risks and potential downside of international investing. Why wouldn’t you want to get in on this wealth-building sector? After all, thousands of your fellow investors are already making big money in the world stock markets. And this is especially true if you’re looking at retirement without enough time to come up with sufficient income to live comfortably, or to build a nest egg for your loved ones. These high-growth stocks are the perfect balance to safe income investments, and can get you up to speed faster than you ever imagined. 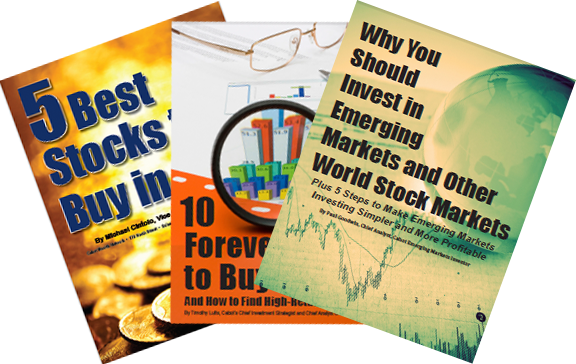 And all you have to do to get started is download this FREE Special Report, Why You Should Invest in Emerging Markets—and Other World Stock Markets. This Special Report doesn’t stop with the emerging markets you most often think of such as the BRIC (Brazil, Russia, India and China) countries. To help you get your feet wet, we’ve also included an informative section on investing in Canadian stocks. Canada’s growth rate is a little higher than that of the U.S., and its stocks have suffered a bit more, so there are many appealing qualities about Canadian stocks that you should consider. These include economic stability, of course, along with the most trusted banks in the world (does that surprise you? ), low volatility, even during the 2008 market collapse, cheap currency and a low tax rate. Take a look at our analysis in this Special Report, and see what you think about investing in Canadian stocks. While the rewards aren’t as great as those in the world stock markets, the risks are lower and it’s a great way to get your feet wet in international investing for the sake of diversity, without taking the more nerve-wracking plunge in less stable countries. We’ve also identified several other “safe” international markets for you too, so you can really spread your wings. Why should you trust this Special Report? Now, you may be wondering why you should care about all of this. Let me just say that Cabot is unlike any other investing advisor you’ve ever used. We’re not just advisors, we’re personal contacts for our subscribers’ guidance and support, which means that our hard-won reputation is expressed in the expertise we’re sharing in this Special Report. Even though you’re not a subscriber right now, we value your opinion. At Cabot, we’re a family of both advisors and investors – many of whom are themselves second generation subscribers. In fact, we’re an actual family here: Our President and Chief Investment Strategist, Tim Lutts, is the son of our company’s founder, another of our analysts is a third-generation member of the family, and our other analysts are all long-term advisors with the company. There are no get-rich-quick folks here at Cabot: you can trust the information and guidance in this Special Report because we stake our reputations on it! So I urge you to download this Special Report right now. It will take only a half-hour or so of your time for the first read-through, and it will make an enormous difference in your investing approach – and the value of your portfolio. You certainly have nothing to lose — $0 – and everything to gain. Download it now! PS: Remember, this valuable Special Report is absolutely FREE. You simply can’t make a better investment than that in your portfolio and your financial holdings. Download it now! PPS: In case you’re still hesitant … remember how I said it was patriotic to invest in world stock markets? Think of it this way: You’ll be a patriot expressing the best American capitalist ideals by seeking out the most profitable investments available, wherever they are.